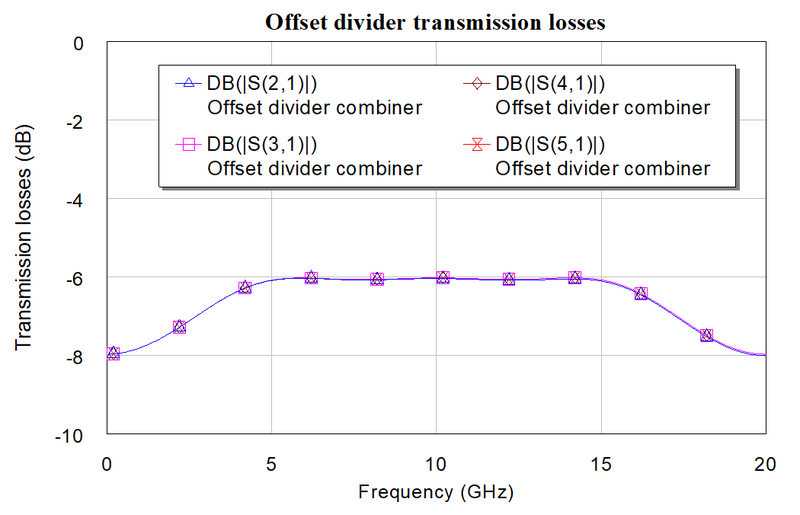 The Darwish offset power divider is related to the traveling wave combiner. Note that engineers use the terms divider and combiner interchangeably for passive reciprocal networks where one port is coupled to multiple ports. Ali Darwish has published several papers at IMS in 2014-2017, on novel dividers. On this page we will discuss a concept which he calls the "offset" combiner (reference at bottom of page), and provide an example. The offset divider/combiner feeds its outputs in series, using (surprise) lines of 45 degree length (E1 in the schematic). Most dividers rely on 90 degree sections. What's going on here? It has to do with reflection coefficient cancellation... more on this later. The output legs are all fifty ohms and their lengths (E2) do not matter so long as they are all the same. In the case of a four-way divider, the first divider pulls off 25% of the power, the second pulls off 33% of the remaining power, and the final divider is an equal split so that each output port receives 25% of the incident power. Predicted power split over frequency for our example is shown below. 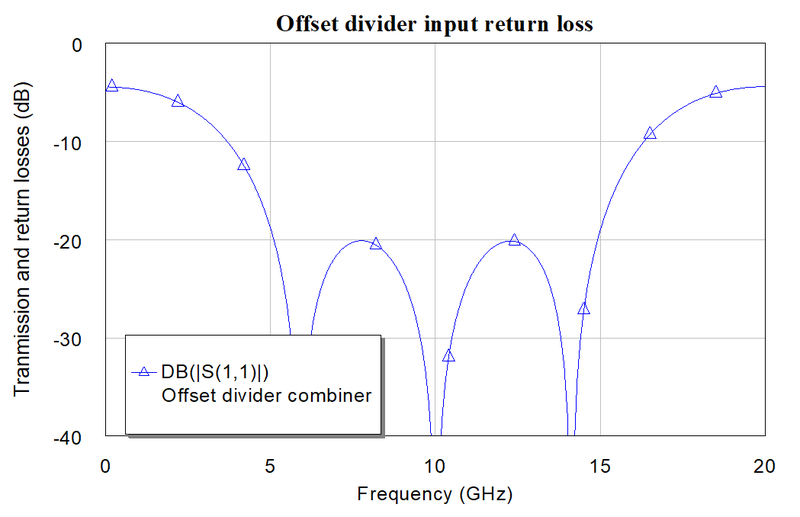 You get perfect- 6.02 dB loss (10*log(1/4) wherever the network is fully impedance matched at the input. Outside of the sweet spot, you suffer mismatch loss. The impedance looking into a reactive four-way divider is 12.5 ohms (50 divided by 4), so that an input transformer must be used to match the input. 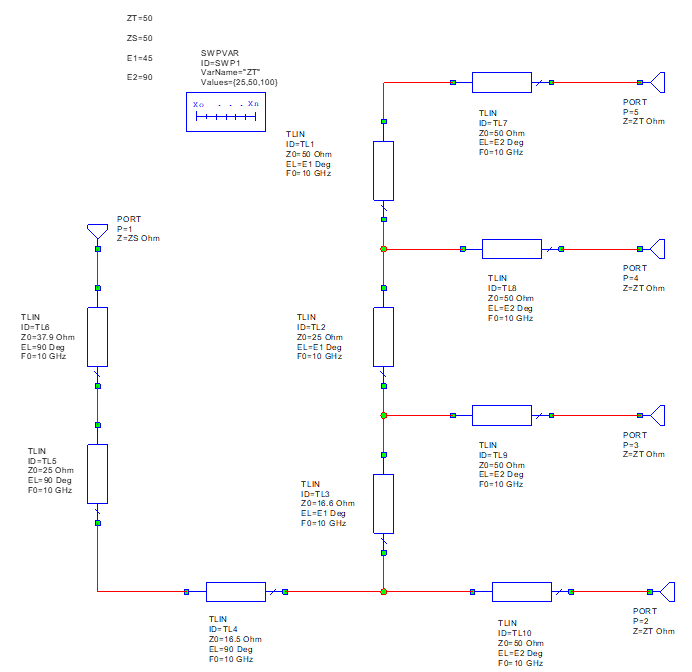 In our example, we went to the Microwaves101 download area, opened the transformer spreadsheet, and created a three-section equal-ripple transformer to match 5 to 15 GHz. The resulting sections are 37.9, 25, and 16.5 ohms. As Ali points out in his paper, you could just use a single section transformer of 25 ohms. Heck, you could use a Klopfenstein taper of a twelfth-wave transformer! Input match for our example is shown below. This divider is purely reactive, which comes with some baggage... it has limited isolation as shown below. You cannot count on graceful degradation for power-combined amplifiers using this network. The output ports are not matched to 50 ohms, which might not matter on the input of a power-combined amplifier, but this could cause unwanted load-pull when the network is used as a combiner. In the future we will show you another network that Ali Darwish published in 2015 which has isolation resistors. What about that claim of reflection cancellation? 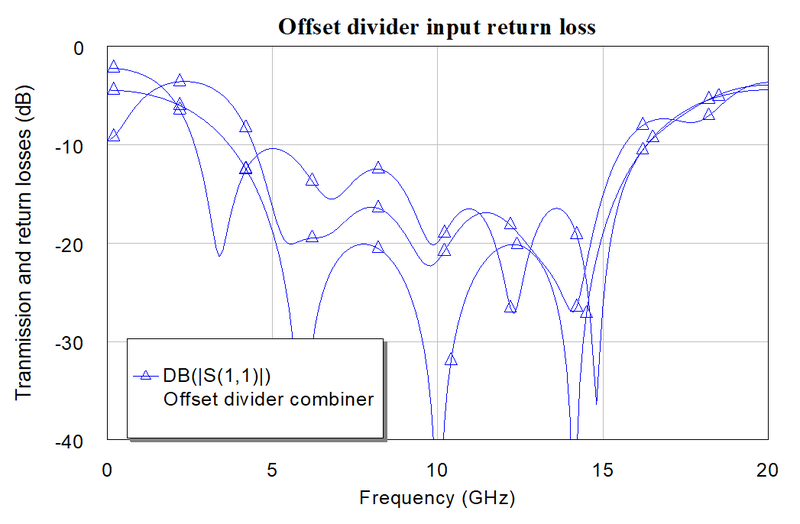 In quadrature combined amplifiers, there is a well-known phenomenon that identicaly mismatched amplifiers magically come out as well matched to fifty ohms because their reflection coeficients become 180 degrees out of phase. In the Darwish offset four-way divider, the lengths of the sections are 45 degrees. This sets up a different form of cancellation, the four amplifiers's reflection coefficients are 90 degrees apart and they cancel toward the middle of the Smith Chart. If you made a Darwish five-way combiner, you would need to grow the 45 degree sections to 36 degrees, or a three-way would need 60 degree sections. Here is a patent where this is called "Polyphase combining" so don't try this at home! Below is the example divider input match when the outputs are 25, 50 and 100 ohms using the "SWP_VAR" to vary ZT (the output port impedances) in the schematic. 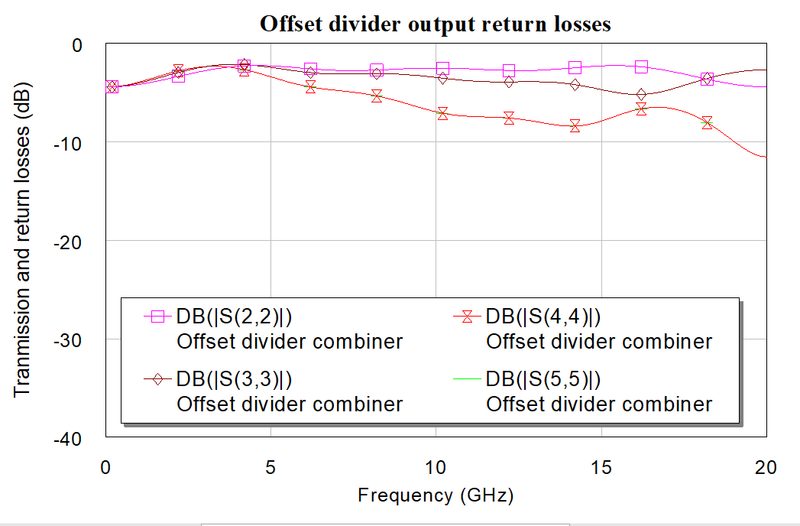 Note that there is great improvement compared to the return loss associated with 25 and 100 ohms (~10 dB), hence we have reflection cancellation. As a further thought, you could lengthen the legs of the four-way network from 45 degrees to 90 degrees and achieve reflection cancellation as well (two of the reflecion coefficients would be 180 degrees out of phase with the other two, just like in a quadrature amplifier). 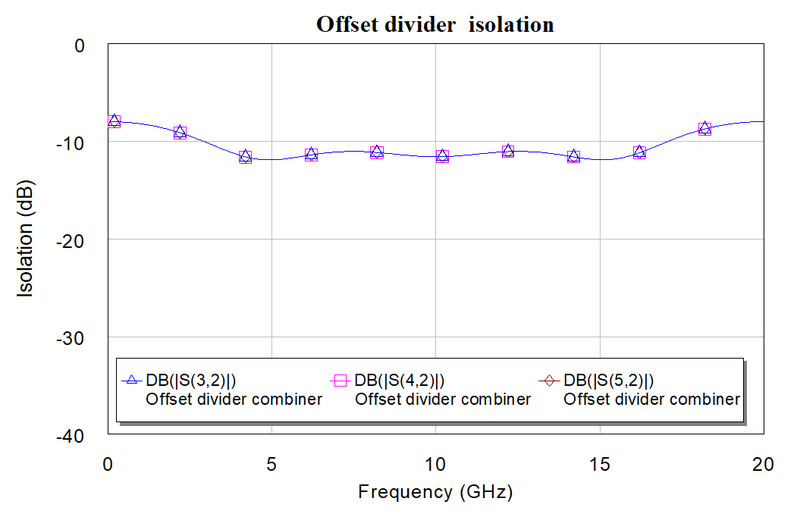 Ali M. Darwish, Amr A. Ibrahim, Joe Qiu, Edward Viveiros, and H. Alfred Hung, "Novel Ka-band 'Offset-Divider/Combiner" with Reflection Cancellation", 2014 IEEE MTT-S IMS, 4 June 2014, Tampa Bay, FL.